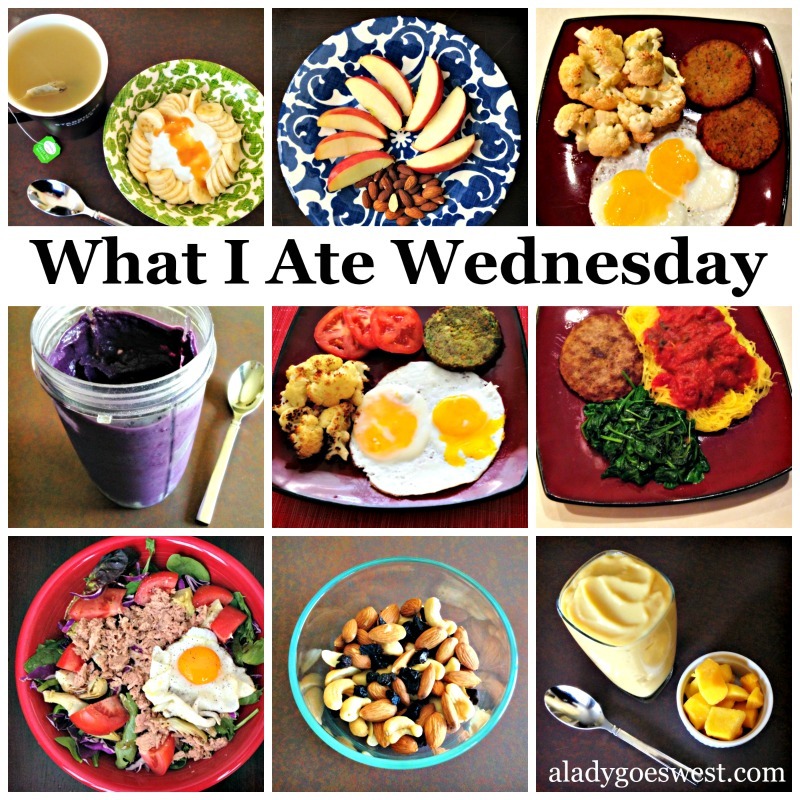 Every single Wednesday is a chance to see one full-day of my real meals in pictures. What I eat works for me, and it’s not the cleanest diet in all the land, but I’m always sure to dine on colorful food and plenty of nutrients. I sure do love to talk about food, so these posts continue to be a regular feature on the blog. Pretty standard stuff here. 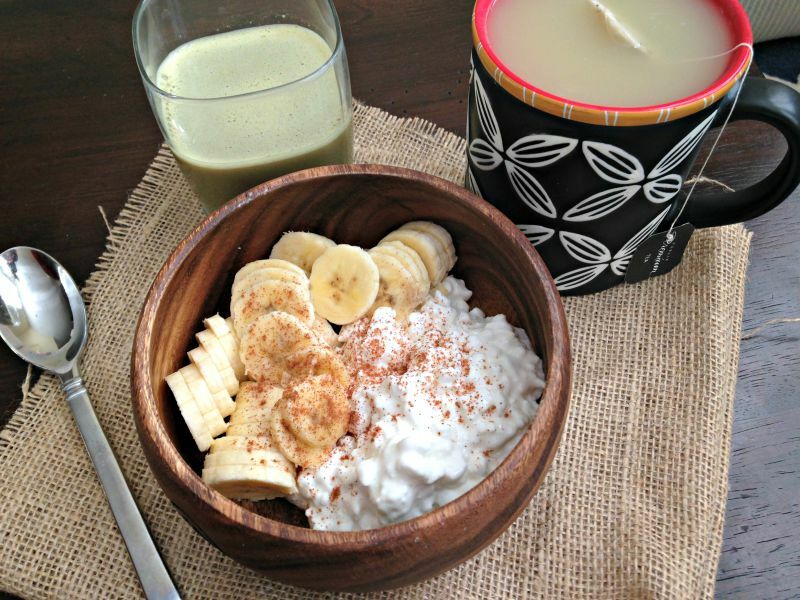 Cottage cheese with a sliced-up banana, topped with cinnamon in a big wooden bowl. I paired that with some green juice and hot green tea sweetened with stevia and soy milk. Not into cottage cheese? You’re missing out! Liquid lunch? 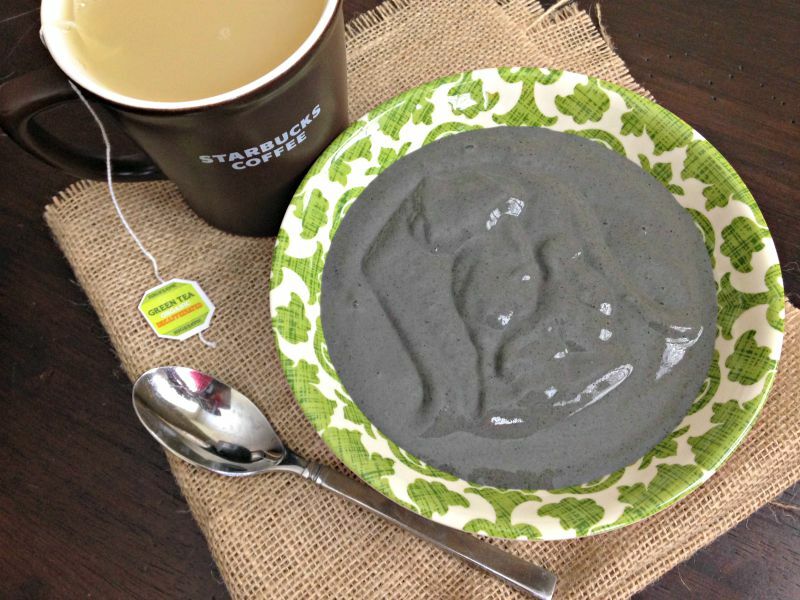 Here’s looking at a second mug of hot green tea, sweetened with stevia and soy milk alongside a hearty smoothie bowl. This smoothie is a power-house containing frozen strawberries, frozen blueberries, frozen banana chunks, veggie powder, two scoops of plant-based protein powder and some soy milk, all blended up with ice. Perfection. Afternoon snack at 5 p.m. Okay, these little packets of Wild Friends nut butter? Totally tasty. I squeezed the nut butter onto the apple pieces for one enjoyable afternoon snack. And yes, I have an apple slicer to assist me in cutting these even-sized slices. 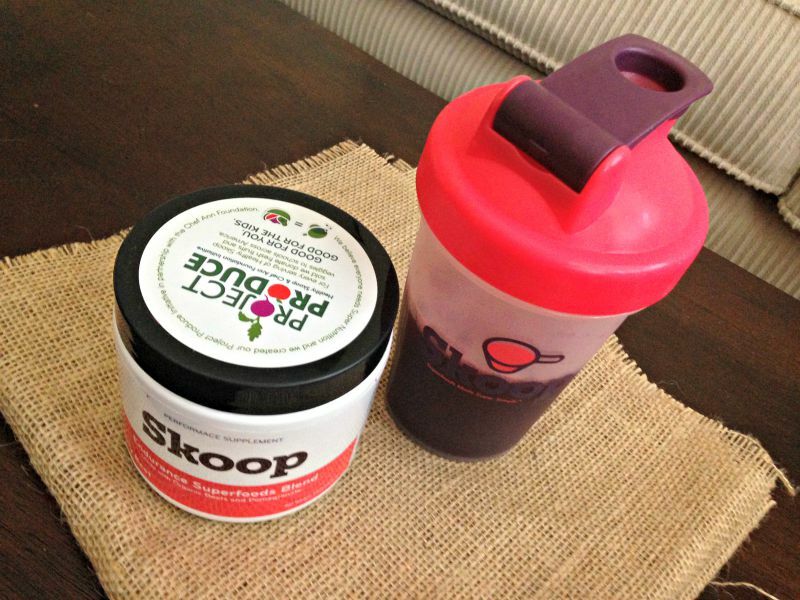 Pre-workout drink at 5:45 p.m.
I’m all about the Healthy Skoop products these days, as I work my way through a care package sent to me by the company after chatting with them at IDEA World Fitness Convention. I had this natural beet energy drink before my workout for a little extra ooomph, and it’s very tasty. If you want to try out Healthy Skoop products, today is your last day to enter my giveaway for a big prize package, so get to it! 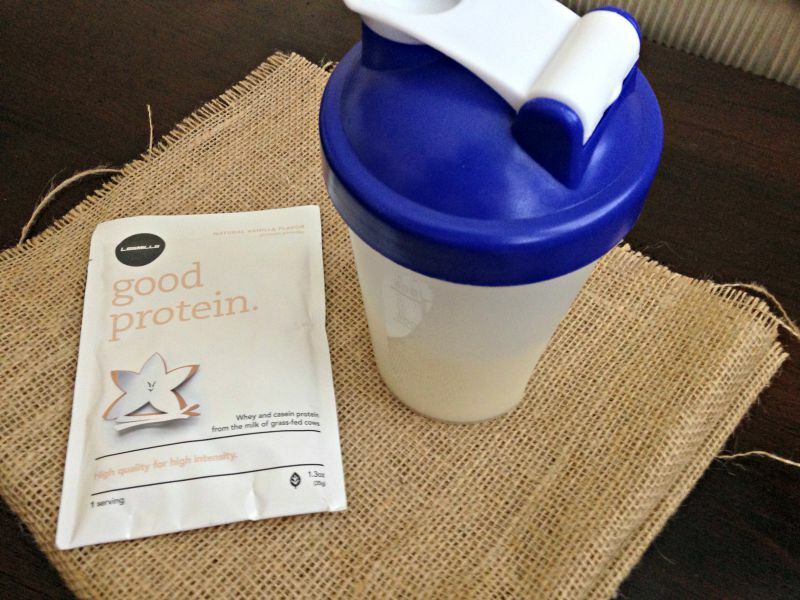 Post-workout protein at 7:45 p.m.
After I got home from teaching a sweaty one-hour BODYATTACK class, (which I was nearly late to because I struggled to find parking outside my busy gym), I dug into this Les Mills Good Protein shake. It was slightly chilled from being frozen a few hours before, and it made me very happy. If you saw my “meal plan” on Monday, then you know that Dave and I had planned a few simple meals for the days of the week that we would be home eating dinner together. 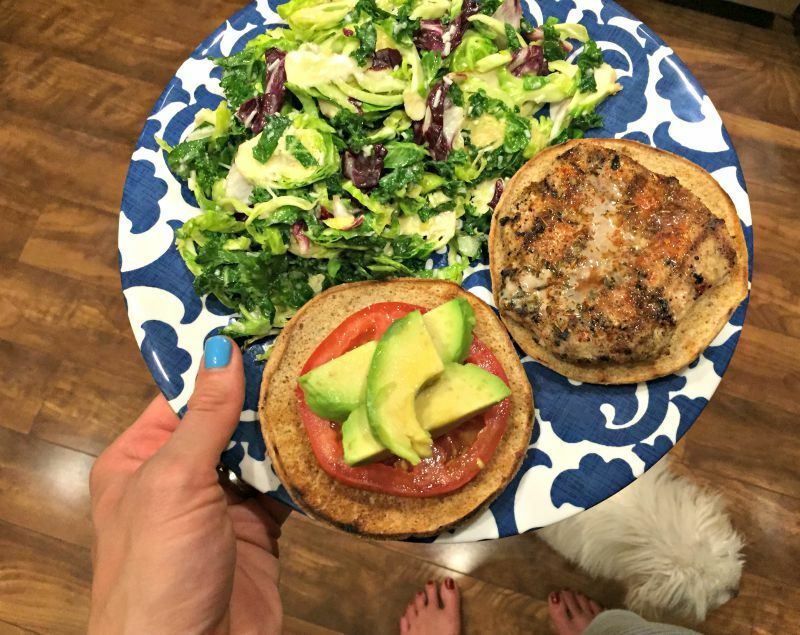 Monday called for grilled turkey burgers and mixed kale salad, which is a staple meal around here. This grilled turkey burger is topped with a sliced tomato, avocado and salsa and thrown on top of a toasted whole wheat thin bun. And yes, you also see a little fluff below the plate, because Rudy the pup has to investigate everything that I do. As usual, I ended my day of eating with a few chugs straight from the vanilla soy milk carton and closed up shop in the kitchen. From there, I joined Dave and little Rudy on the couch to get back to our current Netflix show-of-choice, Orange is the New Black, Season 3. That’s it for my food for one standard weekday. It was a light one in the eats department, but certainly a good one. I hope you have some tasty and healthy meals today as well, and I’ll see you back here tomorrow for a Les Mills group fitness class review. Do you have a balanced dining out strategy? Who doesn’t like pictures of food? Do you want to know what I ate yesterday? Are you eating this sweet and satisfying fruit? What shows are you watching on TV right now? What’s something good going on in your week? 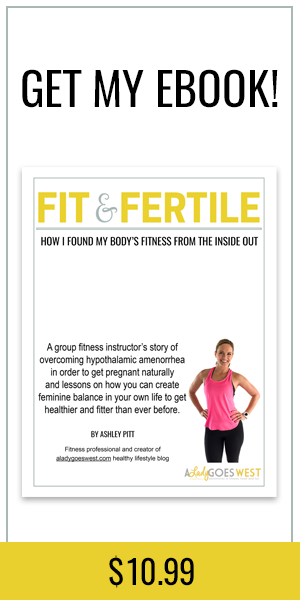 Follow along with me on Bloglovin‘, Twitter, Instagram, Pinterest and Facebook. Always love the WIAW posts! And that mixed kale salad looks super delish. Is that a pre-mixed bag that you buy? Hi Courtney! Yes, ma’am. I always buy the pre-mixed bags and use all the things they include – sometimes adding more dressings. They are, of course, in the salad section at the Safeway where I shop. Good stuff! Best thing I’ve eaten? Hmm… I had a great lump crab and shrimp salad last weekend while in Dallas. I am looking forward to the sushi we will be getting this coming weekend – yum! I love those Wild Friends but butter packets! What’s in your mixed kale salad? I’m a huge kale lover. I can’t believe I didn’t eat it until last year. Hi Megan! This mixed kale salad is a pre-made store-bought version. Kale, brussels sprouts, cabbage, dressing, cheese and little croutons. You have to massage it first and let it sit. So good! Do you make your turkey burgers? We buy the BUBBA kind. They are good, but not amazing. Someone tried to tell me that they thought I should post less about food on my blog. The resound comments about how much everyone loved the food pics from Monday prove that I’m apparently doing something right! Hi Heather! Cottage cheese can do no wrong in my book. I can eat it so many ways, so I’m glad you’re doing it now too. Totally funny you’re going back to Grey’s. I loved that show in college! Hope you have a good day friend, in light of all that’s going on! I’ve seen several grilled veggie burgers on WIAW today. I need to add that to my meals for next week! Hi Stacie! For sure, mine is actually a grilled turkey burger, but you know — same thing? hahaha! I like grilled veggie burgers too! Especially the Dr. Praeger’s kind. Happy WIAW! Thanks, Theresa! Hope you’ve had some good recent eats too. 🙂 Have a wonderful day! So many good eats! I absolutely love Wild Friends! I think I need an apple slicer in my life 🙂 The best thing I’ve eaten lately is a really juicy peach. I’ve had one with lunch every day this week and I even have one waiting for my in my lunch bag – I can’t wait to eat it! 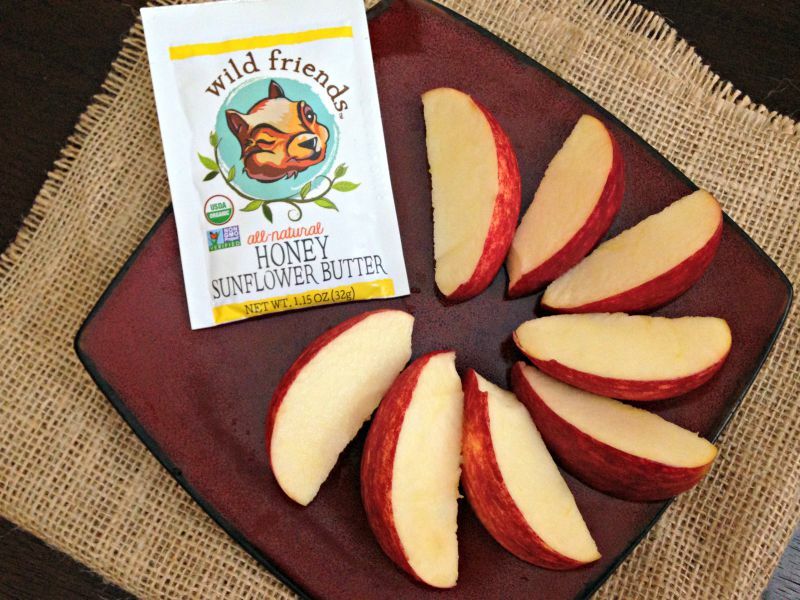 I love the wild friends nut butter- especially the sunflower ones! I think sunflower butter is pretty underrated. It’s not very good plain, but if it is infused with different flavors and some sweetness, it is amazing! I actually love the taste of sunbutter even plain. It’s a weird taste though, as long as you go in knowing it’s not peanut butter heheh! 🙂 Happy Wednesday, Niki! Is that the kale salad from Costco? Brett and I are obsessed with that stuff. I also love that you eat your smoothies in a bowl. For some reason it’s more satisfying that way! Hi Aleah! My mixed salad is store-bought from Safeway. Totally tasty! And always put those smoothies in a bowl and keep them thick. Way more satisfying! 🙂 Happy Wednesday, lady! My sister made a salad earlier in the week with butter lettuce, tomato’s, sliced corn from the cob, bacon, red onion and cucumber’s fresh from the garden. I am getting a massage tonight~~YIPPEE for me!! I saw the skoop booth at Idea World way in the back and planned to go back to it and forgot. How sad! Hopefully I’ll win the giveaway so I can try the products. That breakfast bowl intrigues me – both the dishware and its contents. I’m currently going through a cottage cheese phase so it looks good to me. However, I’m used to eating oatmeal for breakfast so worry cottage cheese wouldn’t keep me full for as long. How much do you use and full-fat or low-fat? Hi there! Yes, cottage cheese will keep you full for a while, especially when paired with fruit and other things. I use the 2% milk cottage cheese (which is low fat, not non-fat) and usually eat about 1.5 cups at a time, which works out to be just under 300 calories and 24 grams of protein — that does NOT include all the other stuff I typically add, that’s just the cottage cheese. I usually add nuts with it, but I didn’t on this particular day. Overall, cottage cheese can work for breakfast. I would say it keeps me about as full as my overnight oat creations. You know I’ve been digging the cottage cheese lately, but I have a harder time liking it paired with fruit or sweet things. I prefer it more as a salty snack for whatever reason! We just finished watching Blacklist on Netflix. I’m not sure how I felt about it at first, but I got really into it and now I’m sad we finished it! Hi Ash! I tend to like my cottage cheese on the sweet side, but have done some salty creations as well. 🙂 I’ve never heard of Blacklist, but I know what you mean about being sad when a show is over! I love your Wednesday eats posts. You eat “normal.” So many bloggers are so calorie and fat obsessed that I think their meals show a bad portrait to young impressionable women. You eat real food, normal portions and some treats or snacks. A good balance is what it really means to eat healthy. Good work! Hi Mo! Well thanks for saying that, I really appreciate it. I am definitely an eater, and what you see once a week in these posts, is my healthiest lightest day. I love veggies, but I also love cream cheese icing hehehe. Glad you notice that! Hope all is well with you. Three cheers for balanced living! I haven’t had cottage cheese in forever, but everything you post a WIAW, I remember that I totally need to go out and get some! It’s just so versatile! Go get some cottage cheese, Morgan! 🙂 Happy WIAW! The kale salad does look good. I used to not like Kale Salad until I learned that you had to massage it first. It was a lightbulb moment. And I liked it after that discovery. Hi Emily! I know, it’s strange that you have to do the massaging, but it changes the game for the taste of the salad. Glad you discovered it and can now enjoy kale! Courtney Bentley recently posted…Does Fruit Make You Fat? Everything looks tasty – especially due to my recent/renewed addiction to apples and nut butter. I’ll have to try sunflower butter though, yummin!! Okay, what is it with the parking at 24 hr fitness?! It is almost always full at every location I’ve been to. Well, except for Moraga. It’s like they didn’t buy enough land for parking or something. I just made a smoothie bowl for the first time yesterday. I love “eating” my smoothie with a spoon! More satisfying I think. Hi Sheena, I definitely prefer to make my smoothies thick enough to eat with a spoon! 🙂 Yay for that! Have a great day! I’m actually surprised that you don’t eat more with all the workouts you do!! I really need to try the new Skoop products. I’m a big fan of their greens and protein powders already! Hi Sue! Well, as you see in this post, this is showing my lightest day of eating of the week — for some reason I typically take photos on Mondays, always coming off of the weekend and am a little less hungry. However, many days have a couple more snacks involved and weekends are quite different. My food is all really calorie dense, so it’s more than my fair share. 🙂 Certainly not going hungry over here! And YAY for Skoop. I’m having some right now!